What will be remembered from this race at Phoenix International Raceway? Will it be Jimmie Johnson blowing a tire and crashing, allowing Brad Keselowski to take a commanding points lead going into the season finale at Homestead? Or even Kevin Harvick winning the same weekend as he announced that he would leave Richard Childress Racing for Stewart Haas Racing after next season? 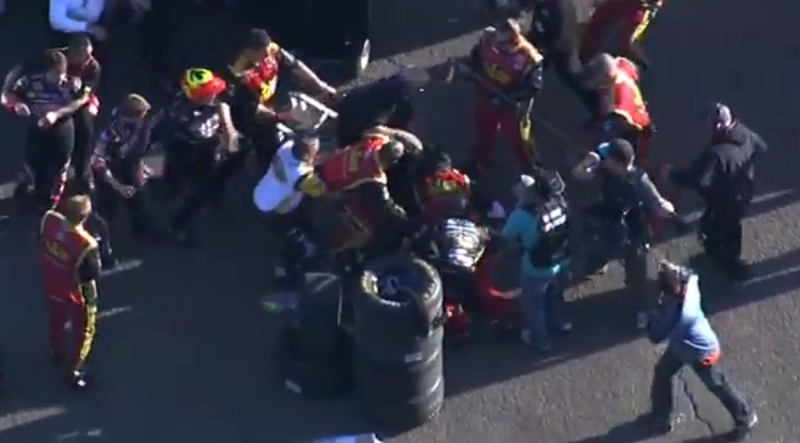 Wrong and wrong; what will be remember from a wild and crazy race will be this huge brawl between Clint Bowyer and Jeff Gordon on the second to last lap. Let's go to the videotape. I mean, when you have a crew chief swear on air and it be by far the most tame action in the chain of events, you know you have something wild. Gordon and Bowyer have had some skirmishes before but I really put all that on Gordon there and in that he crossed the line. The earlier incident in the race was simply just hard racing and for him to take him out like that, as well as some other guys like Joey Logano, was pretty low.